As mentioned in a previous post, I decided my life wasn't busy enough so I've started to volunteer at the local Beaver scout group. This has been great fun and with a group of friends its been fun to have a bit of input into what we get up to each week. A few weeks ago one of my friends and I got to plan out the lesson on healthy eating. This is a subject I'm quite passionate about and really enjoy getting my own children to help with food. We were constrained a bit though, having fourteen 6-8 year olds cooking at the same time would be hard work and having enough facilities to keep them all occupied would be nearly impossible! 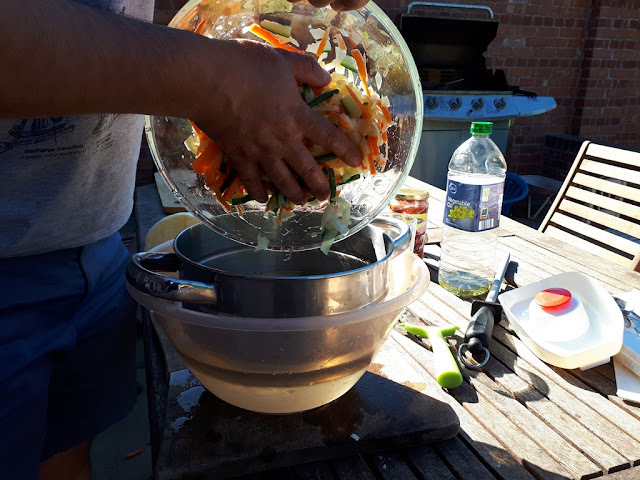 My friend is half Malay and has some amazing recipes in his repertoire and that of his mothers, he suggested making Acar, a spicy Malaysian pickle. We looked at the recipe and decided that if we did some prep first (actually it was A LOT of prep first!) then it should just fit into the hour and a quarter that we have them for! One thing we needed to do was to make sure that it was fairly low allergy, no nuts or seeds if we could help it and leave the shrimp paste out as well. To make sure it was tasty and could be done in the time we made a batch the week before combining a few recipes to get it right. 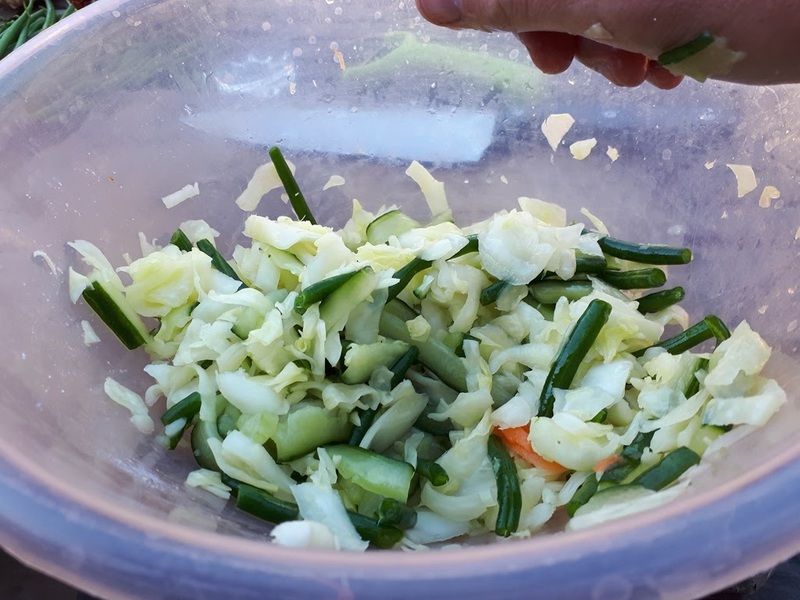 The veg in the pickle are crunchy, and the flavour from the blue root ginger, lemon grass and chilli is out of this world! when I have a jar in the fridge I have it with everything, in sandwiches, on salads or as a side dish! It's quite simple to make but involves a bit of timing. Put all the veg into a large bowl and then add the salt and sugar - it seems a lot but it'll be washed off later. Here you can either let the veg sit for an hour or start working them. We scrunched them up with our hands and the salt and sugar soon draws the moisture out of them! Work them hard for a good ten minutes then let sit if you have the time. Pour away the moisture and rinse them in cold water to wash away the salt and sugar. They now need drying out. Put them in a clean tea towel and squeeze out as much moisture as you can, then lie them somewhere so they can dry out some more. Luckily it was really hot and sunny when we were doing this so they dried out really quickly. It's then time to make the paste that will coat all the veg. You can use the fresh ingredients of any of the above if you have them but this was all we could find at the time! Peal the shallots and then blend them to a paste. Add them to a frying pan and cook through slowly without burning them. 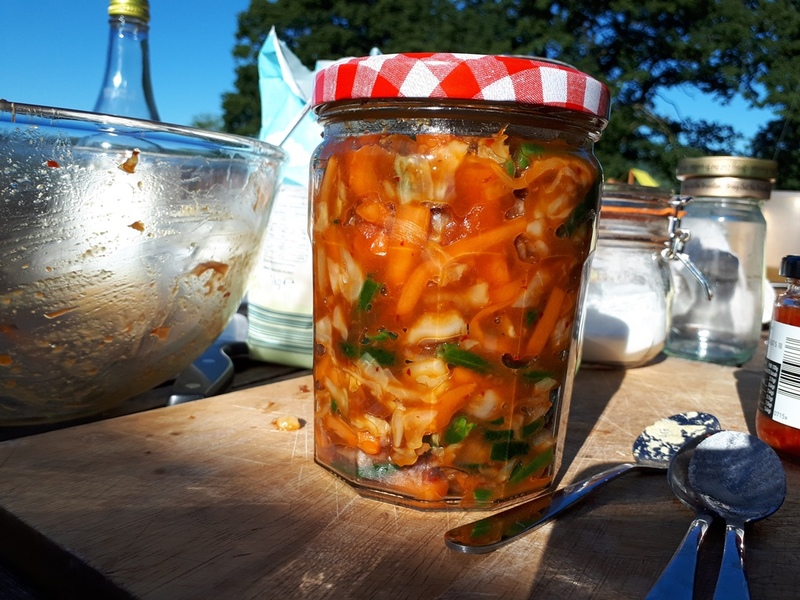 Add the other ingredients, keep tasting it here and adjust to taste, we added a lot less chilli with the Beavers but we both like it quite spicy - my friends mum has a version that will blow your head off! Once this paste is made and cooked through collect up all the veg in a clean dry bowl and add in the spice paste. Mix well and make sure it's all coated. Force it into a sterilised jam jar and make sure there's no big air pockets in there. Keep it in the fridge for a week to mature before you try it. It should keep for a month in there, but I'd be surprised if it lasted that long! It was a great success at Beavers on the night, the kids loved making it! I had quite a few parents remark to me a week later that normally their children never eat many vegetables but were desperate to try this pickle! 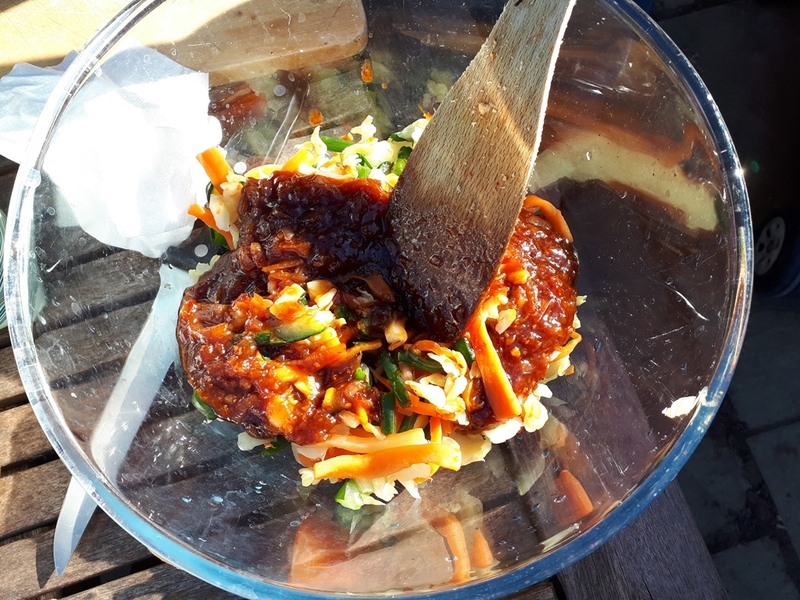 To get the Beavers involved they mixed all their veg, added the salt and sugar, scrunched it up, rinsed it and dried it out. We cooked the paste for them but they smelled ingredients and tasted different bits and added the paste straight into the jar for them to shake around the scout garden like crazy people! This recipe is just perfect for using up a summer glut of veg and I'm sure it would work with other veg as well. Try adding sesame seeds and peanuts as well for a bit more flavour and texture. Like I mention before when I have a jar I use it all the time so it doesn't last long. 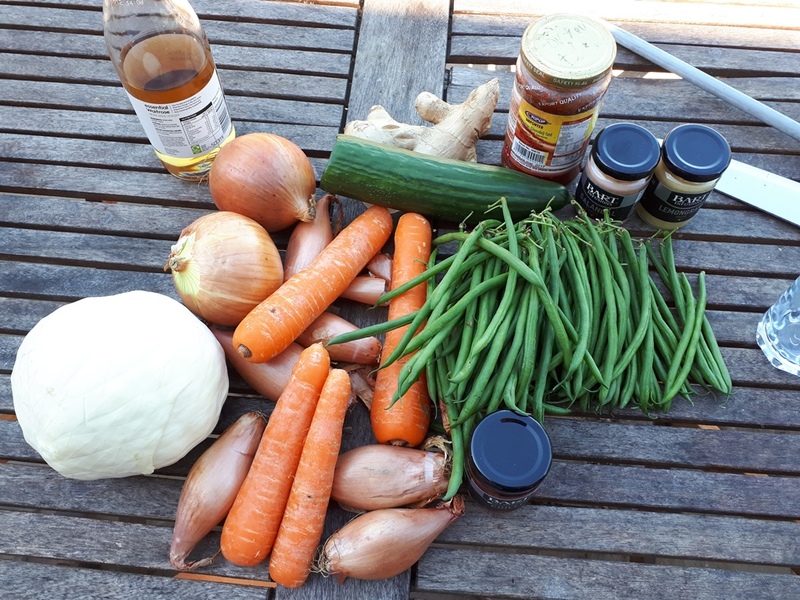 What recipe do you like to use to use up a glut of summer veg? Have you tried Acar before or will you give this a go? Let me know if you do! That sounds absolutely delicious, galangal is going on the shopping list! I'll definitely be making it. My friends husband is Malay, I can try it out on her! Her children also have an alarming list of allergies so seed/nut/shrimp/everything free is perfect. 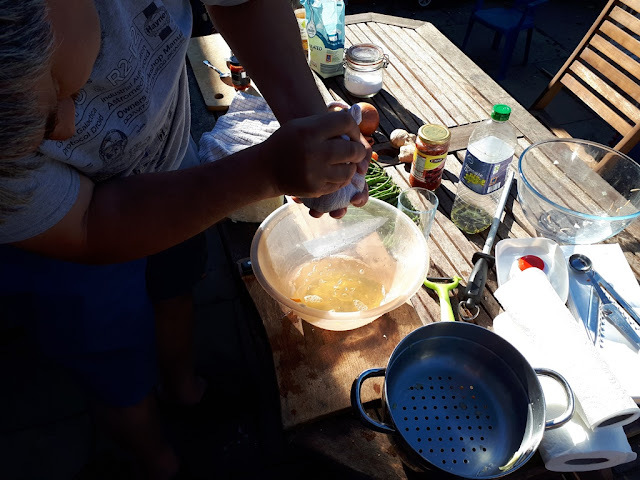 It's funny how Scouting and Guiding volunteers always seem to be busy people already ;-) I run my local Rainbow unit and we do quite a lot of cooking (and gardening and walking and nature based activities...) but we haven't tried anything as adventurous (in taste) as this. Maybe next term! My son was a Beaver and absolutely loved it. His favourite meeting was when a mum with a crayfish licence took them to catch crayfish using bacon and bike wheels amongst other things and then they cooked them on the river bank. I was always told if you want something done then ask a busy person! not sure that's true with me though! my daughter is loving Beavers at the mometn adn love the idea with crays although there's no rivers up here very near, be a great night though. I'd love to do it myself! These were from Waitrose I think. My mate picked them up! and this is exactly how you teach children to try new foods! Yes! They were all so excited about some fresh veggies! I'll be joining the boy scouts....me thinks! Just the Scouts now! All can join! They always need volunteers! Our family favourite is 'Compost Fry-up'. A mix of whatever is in the garden, fried in olive oil, then at the last minute sprinkled with Cumin powder. It is surprisingly good! I love anything fried so no doubt I'd love this! I'll try it ! Not sure if my last comment worked- do you mind if I share this Kev?